Summer is the season for tomatoes that actually taste like tomatoes. When I was in middle school, a friend and I used to enjoy homegrown tomatoes by the slice, with just a little salt on them to bring out those rich flavors. A tomato mozzarella (caprese) salad makes good use of all that fresh tomato flavor, balancing it with creamy fresh mozzarella and sweet, mildly peppery basil. The one drawback to serving caprese at a picnic is that it’s not a finger food. That is, it hasn’t been a finger food until a Pinterest trend officially made it one. Now, people at picnics and parties everywhere are eating caprese salad on a stick. 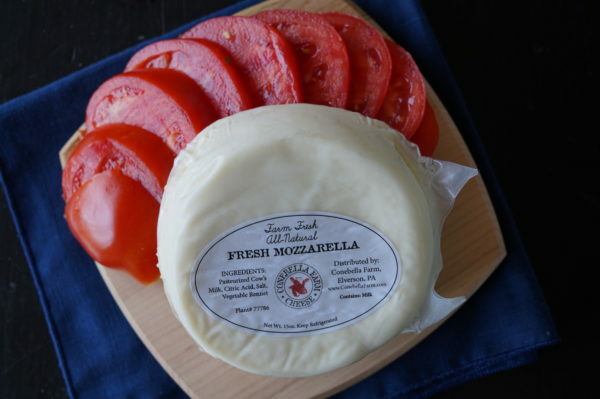 This recipe uses Conebella Farm Fresh Mozzarella. This is one of the Gable’s fresh pasteurized cheeses. How fresh are these cheeses? So fresh that they’ll be milk on a Monday, made into cheese on a Tuesday, and then you’ll get the cheese that very week! Since they must be made fresh, they do tend to sell out quickly. Pam recommends preordering them by contacting her at Gable@ConebellaFarm.com. If you end up stocking up on more than you can use right away, it is possible to freeze the cheese. Pam has had success with this. 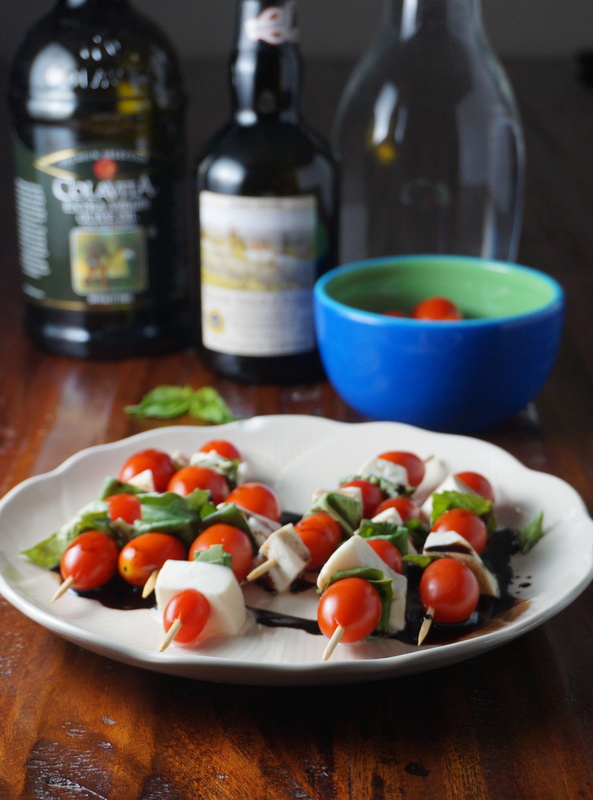 This caprese on a stick recipe also uses a drizzle of balsamic reduction. You can buy balsamic reduction as its own thing, and often farmers markets and food festivals will feature an artisan vinegar/olive oil vendor you could buy an especially nice bottle from. But it’s also easy to make your own. You just figure out how much you’ll need to end up with, double that quantity, and then low-boil the vinegar until it is reduced by half. It does make your house smell like vinegar, but if you are making it in the summer you could keep the windows open and invite a fresh breeze. If you have extra, you could pour the vinegar reduction into a small dish, pair it with another dish of olive oil, and slice up some fresh-baked bread for dipping. Caprese salad is now a finger food! Load onto a skewer: 1 tomato, one Mozzarella square, 1 folded basil leaf. Keep going until skewer is full. Arrange on a plate and drizzle with balsamic reduction.